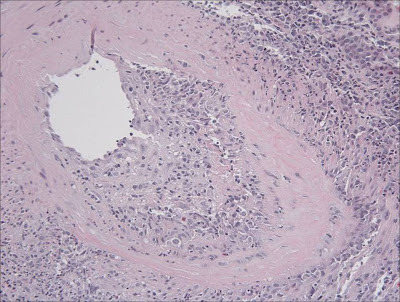 Vascular rejection has been traditionally considered a severe form of acute rejection characterized by infiltration of mononuclear cells beneath the endothelium or by the presence of arteritis. Though initially reported as an aggressive form of T-cell mediated rejection with poor response to T-cell targeted therapy, newer findings suggest a strong association with alloantibodies. 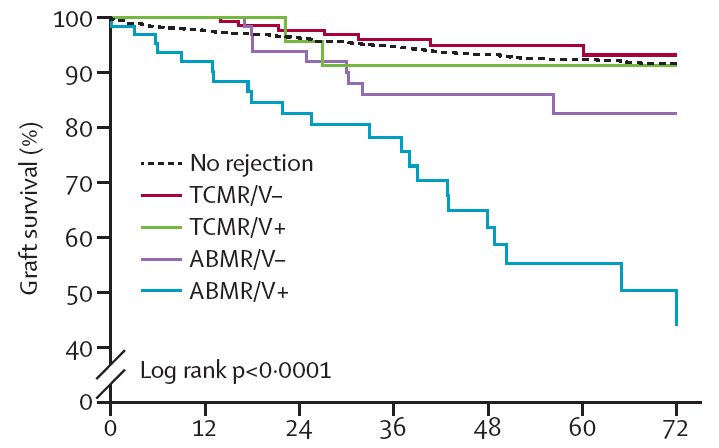 Study from France analyzed 302 patients with biopsy-proven rejection and identified 4 subtypes of acute rejection with different outcomes (Figure): T-cell-mediated vascular rejection (9%), antibody-mediated vascular rejection (21%), T-cell-mediated rejection without vasculitis (46%), and antibody-mediated rejection without vasculitis (24%). 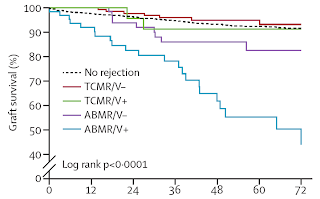 Antibody-mediated vascular rejection manifested a median of 1.1 months (0.4–4.4) post-transplant and had the worst prognosis of the four subtypes. Moreover, 71% of cases of vascular rejection, which were mostly graded as v1 and v2 arteritis by the Banff schema, were associated with donor-specific antibodies (DSA). 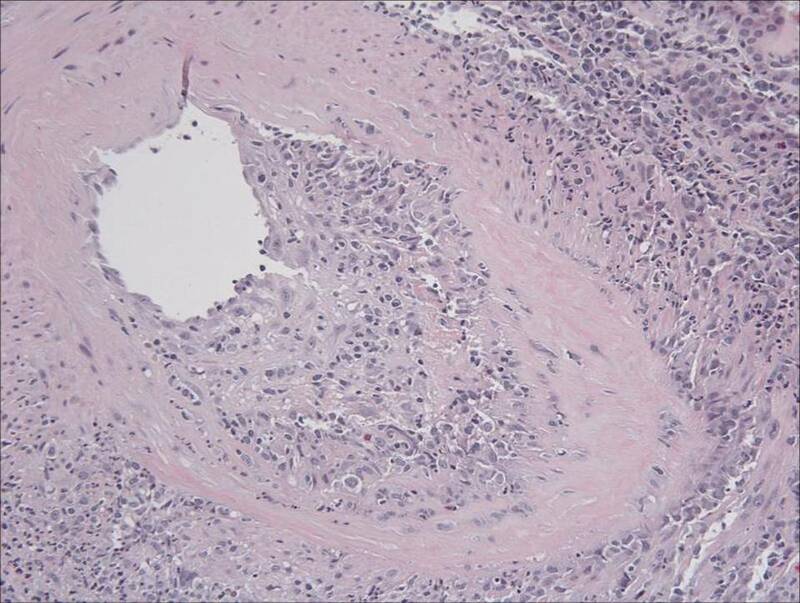 Therefore, it seems that the majority of cases of vascular rejection are associated with DSA and therapies to remove and decrease alloantibody production may be warranted. Indeed, this study suggested that antibody-directed treatment involving plasmapheresis, IVIG and rituximab led to better outcomes in this subpopulation. As of today, v1 and v2 vascular lesions are not accounted by the Banff classification in the antibody-mediated rejection category. Alloantibodies may bind to endothelium antigens and activate complement, attracting mononuclear cells which express Fc and adherence receptors, initiating the process of vascular infiltration. How will this affect our practice? Whenever a biopsy shows a component of vascular rejection, one must send the serum for alloantibody testing, even if biopsy is not classic for antibody-mediated rejection. Furthermore, antibody-directed treatment strategies should be considered, in particular if no response to initial therapy and evidence of DSA. 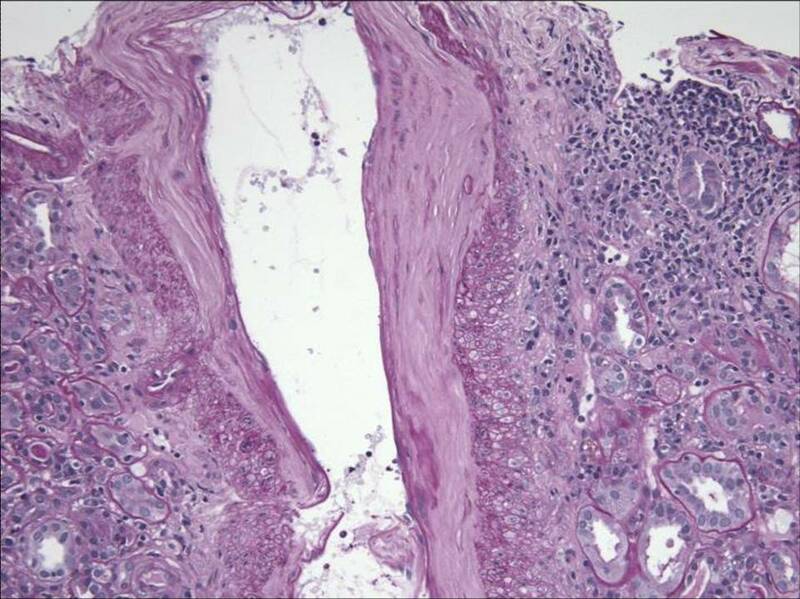 The ideal treatment of the different severities of vascular rejection still remain to be determined. 1) Surreptitious vomiting or diuretic abuse - metabolic alkalosis, Laxative abuse - non-gap metabolic acidosis. 2) Aquaporin 2 - apical membrane of collecting duct, Aquaporins 3 and 4 - basolateral membrane of collecting duct, Aquaporin 1 - proximal tubule. 1) be able to support a blood flow of 600 ml/min 2) be at a maximum of 6mm from the surface 3) have a diameter greater than 6mm. 5) Calcineurin inhibitors, key differences - Tacrolimus: hair loss and higher rates of NODAT. Cyclosporin: hair growth and gum hyperplasia. The Lupus Foundation of America is proud to announce its new Career Development Award RFA. 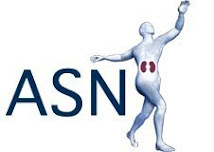 The purpose is to facilitate the professional development of nephrology, dermatology, and rheumatology fellows, in the U.S. and Canada, interested in lupus research towards a career as an independent clinician-scientist at an academic, medical, or research institution, with a research program having considerable focus on the investigation of basic, clinical, translational, behavioral, or epidemiological lupus research. To be eligible, applicants must hold an M.D. (or equivalent) from an accredited institution, be a U.S. citizen or legal resident of the U.S. or Canada at the time of application submission, be a first or second year Fellow in an adult or pediatric fellowship program in rheumatology, nephrology, or dermatology accredited by either the American Council on Graduate Medical Education (in the U.S.) or Royal College of Physicians and Surgeons (in Canada). There is no Letter of Intent. The application deadline is March 29, 2013 and the earliest funding notification is May 10, 2013. The award is for $70,000 (with the possibility of a 1-year renewal) and can be used for salary and/or research, but certain restrictions apply. In addition, awardees of specific grant mechanisms are ineligible. Please see the RFA for complete details. You can find the Career Development Award RFA at http://www.lupus.org/rfa. A few years ago, a unit that I worked at started using hemodiafiltration (HDF) routinely for the first time. Prior to starting our patients, we visited another unit where they had been using HDF for a few years and interviewed some patients who had undergone both methods. The patients uniformly said that they felt better on HDF than they had before on regular HD. Of course, part of this may have been psychological - the fact that they knew that they were getting a new, "special" treatment. HDF works by combining diffusion with convection and is known to clear middle molecules better than HD alone. Unfortunately however, some of the proposed benefits of HDF have not played out as expected. HDF has been shown to have no mortality or CVD benefit over HD. Still, there were hints from various studies that there may be a benefit in terms of health-related quality of life (HRQOL) for patients on HDF. For patients on dialysis, this would be a big deal. This month's article highlighted in eJournal club attempted to answer this question. This was a randomized trial using data from the CONTRAST study comparing HD with HDF. HRQOL was a prespecified secondary outcome. Over an average of two years follow-up all domains of HRQOL declined except for overall health which improved in the HDF patients although there was no significant difference from the HD patients. These results were disappointing. Head over the eJournal Club to continue the discussion. Interesting paper this month in JAMA about post-marketing studies of adverse drug effects. Randomized controlled trials are obviously the gold standard for the detection of common adverse events related to treatment. The problem is that, if an adverse event is rare, it is unlikely to be detected by a normal RCT. As a result, there has been a move recently towards conducting post-marketing studies of commonly used drugs to identify rare adverse effects. One such effect mentioned in the study is the association between bisphosphonate use and atypical femoral fractures. The other commonly cited example recently was the association between PPI use and community acquired pneumonia that has been noted in multiple studies. The putative mechanism is that it is due to a reduction in gastric pH. The problem is the question of residual confounding - is there an alternative reason that these patients have more pneumonia. Are these patients simply sicker overall? Are PCPs who prescribe PPIs more likely to diagnose pneumonia? 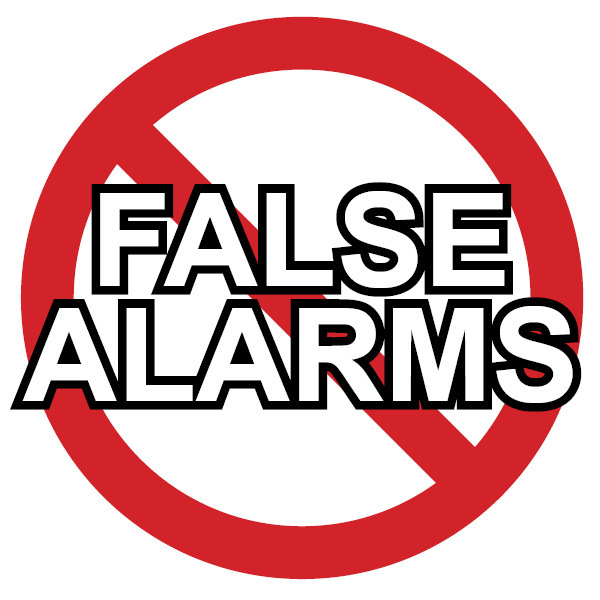 Just because there is a plausible mechanism doesn't make it true. One potential solution is to perform a falsification analysis. Once you have determined the primary outcome of the study (in this case pneumonia) with a plausible outcome, you then perform a series of prespecified analyses with other non-plausible outcomes. If all of the outcomes are associated with the use of PPIs, it suggests that the association is more likely related to residual confounding rather than a real effect. In the study referred to in the JAMA article, the authors, working from registry data, not only found an association between PPI use and pneumonia but also with osteoarthritis, urinary tract infections, rheumatoid arthritis, chest pain, DVTs and skin infections. Thus, they suggested that the association with pneumonia was more likely to be confounded because of the lack of a plausible relationship with these other adverse events. One criticism I would have is that I could think of perfectly reasonable hypotheses for why PPI use could be associated with OA and RA (use of NSAIDs) and chest pain (GERD). Another important point is that if this is not done properly (prespecified adverse events) you could find an association between the use of a drug an some adverse event if you tested enough and it could be used to wrongly refute the association between a drug and a problem. Still, the whole article is a fascinating insight into the problems with post-marketing studies of drugs in the wider population. To follow up on one of Nate’s posts from 2010, hair grows not only on your skin. He describes a glomerular capillary to be hairy. 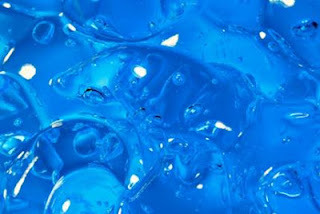 Glycocalyx, a hairy structure attached to the glomerular endothelium, is a mixture of glycosaminoglycans and proteoglycans. The picture of glycocalyx accompanying that post is quite impressive. Now we know these hairs are coated with another gel matrix called endothelial surface layer (ESL). ESL, together with glycocalyx, is believed to function as a barrier to prevent protein passage from blood to urine. A recent article addressing this topic was published in JASN. By using an animal model, the authors showed that loss of ESL increases the sieving co-efficient for albumin and that the degree of albuminuria correlates with the degree of ESL loss (by the way their confocal microscopy images of ESL are pretty cool). The implication of the study is that it’s not just podocyte or GBM that are responsible for the development of proteinuria; ESL, glycocalyx and endothelium appear to play an important role as well. For example, loss of ESL has been reported in patients with diabetes. Maybe it’s not just on the skin where hair loss occurs. For those who are interested in this topic, there is a nice review article for further reading. 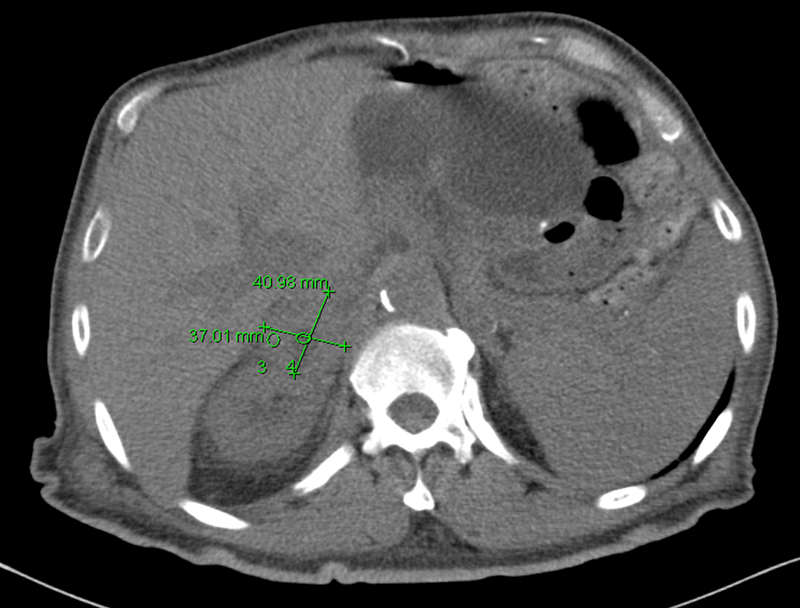 A man in his 50s with a history of diabetes, renal stones, gastric bypass surgery and CKD stage III/IV presented to the clinic with fevers, chills and vague abdominal pain. A urine culture was positive for E Coli and he was treated with a quinolone with resolution of his symptoms. 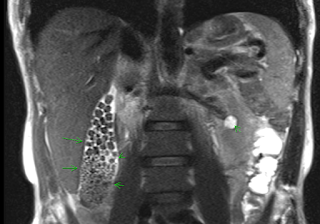 In view of his previous history of renal calculi, a CT abdomen was ordered. The CT scan revealed a 5 x 2.2 cm mass lesion in the right renal/suprarenal region inseparable from the kidney and the right adrenal gland and the differential diagnosis was either a RCC or adrenal carcinoma. He then proceeded to an MRI abdomen. 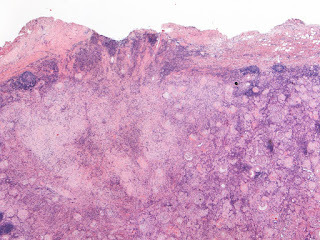 This again showed a mass in the right suprarenal region, inseparable from the right kidney and adrenal gland with some central necrosis. At this point, the decision was made to proceed with a partial nephrectomy for likely carcinoma. 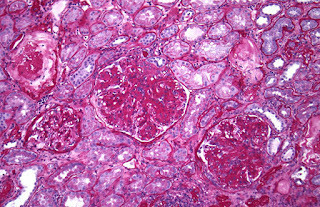 This is a low-power view of the renal cortex. There is diffuse global glomerulosclerosis involving approximately 80% of glomeruli. 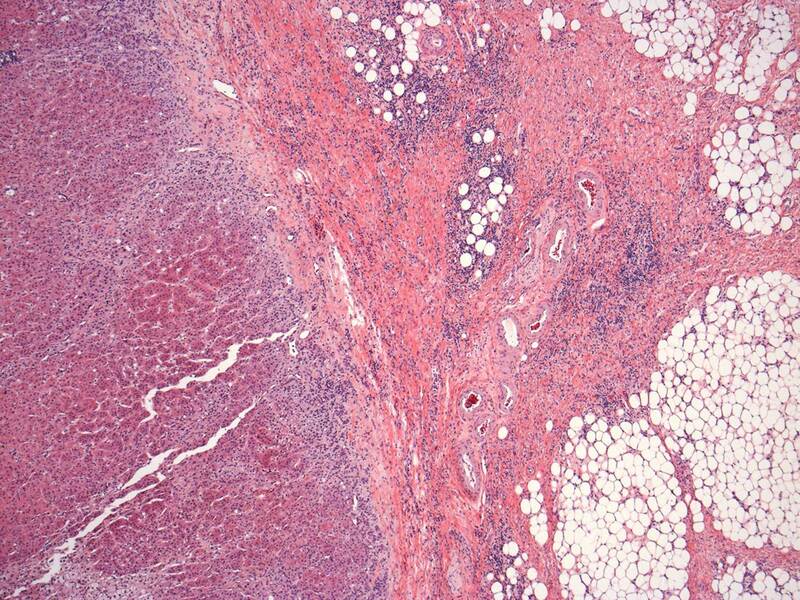 There is also significant tubular atrophy and interstitial fibrosis with associated areas of inflammation. 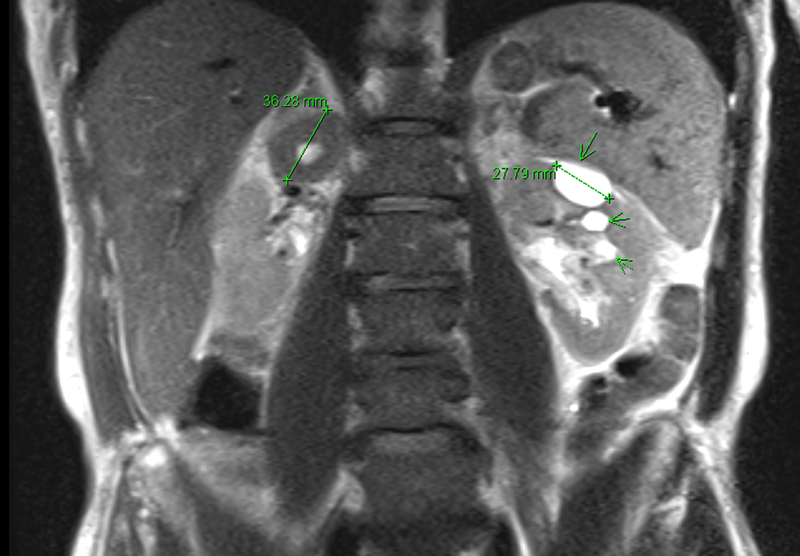 There was focal perirenal and intrarenal scarring with disruption of the renal capsule. 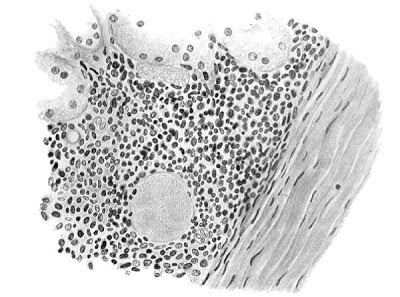 The adrenal gland was essentially normal apart from some focal inflammation and adhesion to the capsule. There was no evidence of any malignancy and it is likely that the changes seen were a result of infection which had resolved by the time of the surgery. 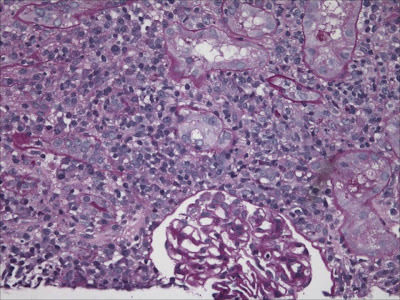 Higher power view of the preserved glomeruli revealed changes characteristic of diabetic nephropathy - nodular glomerulosclerosis. Interestingly, he also had many tubules containing oxalate crystals, likely related to his previous gastric bypass surgery. There was associated acute tubular injury. This case lead to an interesting debate in our conference. Should he have been treated for a longer period with antibiotics and then rescanned prior to the resection. In the end, the consensus was that the treatment he received was appropriate. Multiple imaging studies were done that were suggestive of malignancy and he had constitutional symptoms including weight loss and fever. 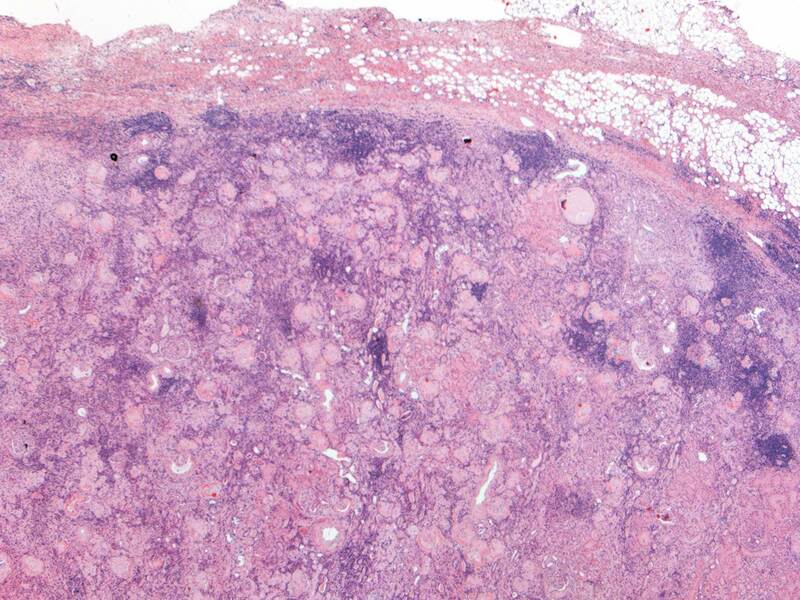 A review of all tumor nephrectomies performed at BWH a few years ago revealed that 1/110 cases was not actually tumor. It is hard to argue in that setting that delaying the resection is the appropriate management. Of course, in this case, there was the added complication of advanced CKD and he has now lost some of his residual GFR (although his creatinine has returned to the pre-surgery baseline). One final image: on the MRI scan, he was incidentally found to have multiple gallstones - I just thought that the picture looked really cool. The dates and locations for this year's Home Dialysis University for Fellows have been released. This is a series of courses on home HD and PD aimed at graduating fellows that is sponsored by the ISPD. 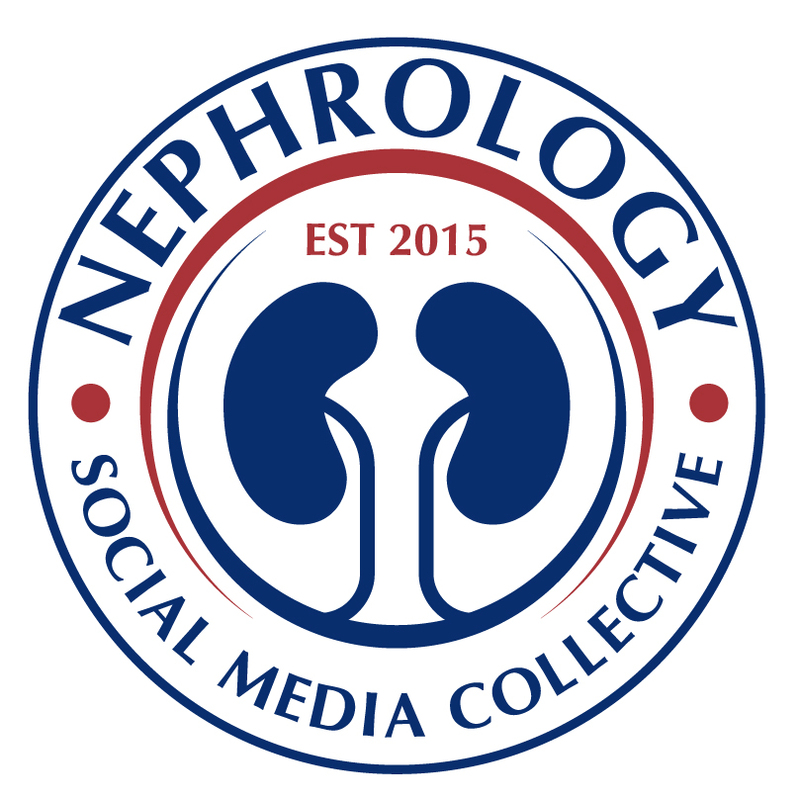 You can check out the RFN review of the course here and our twitter feed from it here under #HomeDialysisU. The 4 locations are Charlotte, Dallas, Denver and Chicago and they are going to take place once a month from February to May. The site for the fellows version is here. There is a similar course run for practicing renal physicians although this is starting in just 2 days in New Orleans. The website for the non-fellow's version is here. 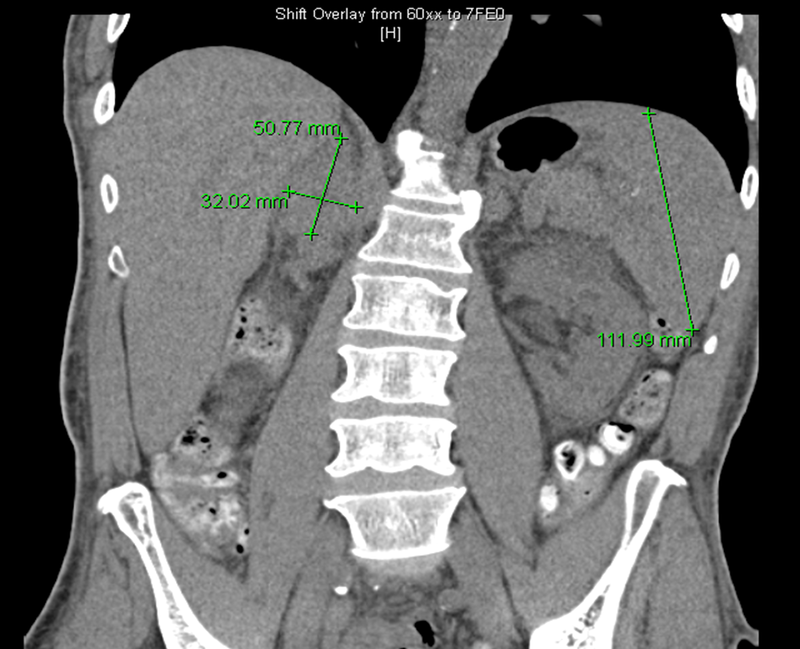 The renal services were consulted on a man in his late 70s with a distant history of colon cancer, recent pneumonia and NSTEMI, for investigation of worsening renal function. 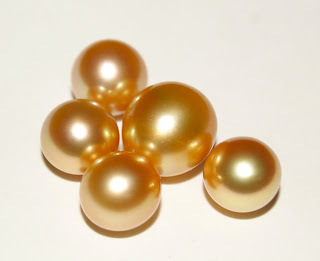 He had sub-nephrotic range proteinuria (2-3 g/24 hours) and an elevated creatinine (2.3 mg/dl). His serum albumin was 1.8 g/dl. Serologies revealed a negative SPEP and UPEP but a positive p-ANCA (MPO 354). His clinical condition deteriorated and he was transferred to the ICU. Notably, his urine sediment contained muddy-brown and granular casts with no dysmorphic red cells and no red cell casts. 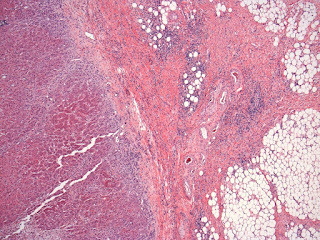 At this point, the differential diagnosis included a vasculitis, drug-induced vasculitis (although this is usually associated with higher ANCA titers) or ATN. We proceeded to a renal biopsy. 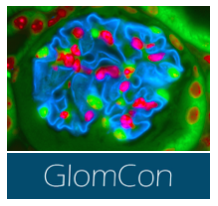 Higher power view of the cortex revealed relatively normal-appearing glomeruli with no inflammation and no crescents. There were some chronic changes with approximately 11% globally sclerosed glomeruli but this was not thought to be related to the current presentation. 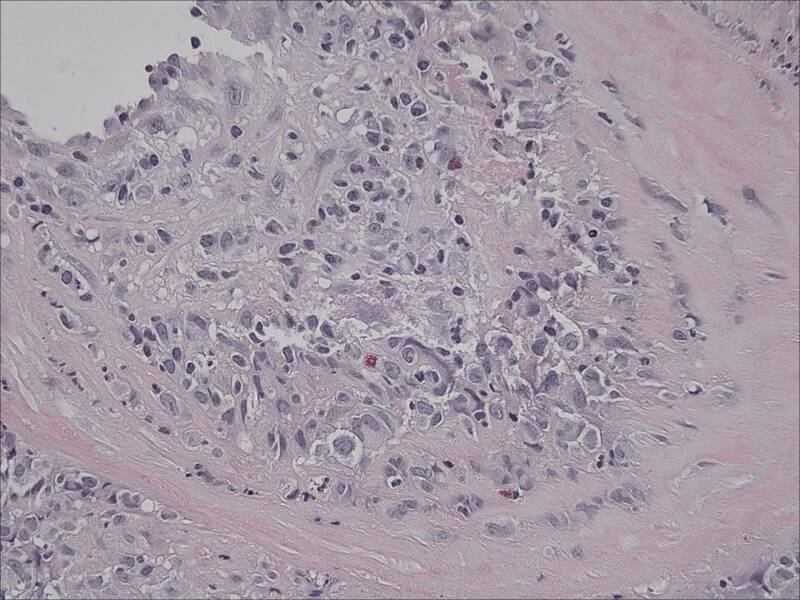 There was a dense interstitial infiltrate with many plasma cells and occasional eosinophils. The small arterioles looked normal. This is a two views of the same section of a medium-sized artery. 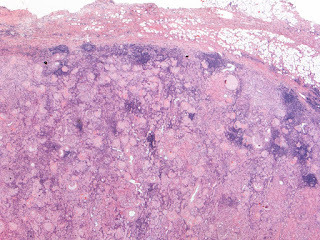 There is massive infiltration of the vessel wall characteristic of a vasculitis -specifically this has the appearance of polyarteritis nodosa. There was significant fibrin deposition on IF within the walls of the vessel. There was also some mesangial deposition of IgG and IgM. This is a fascinating case. 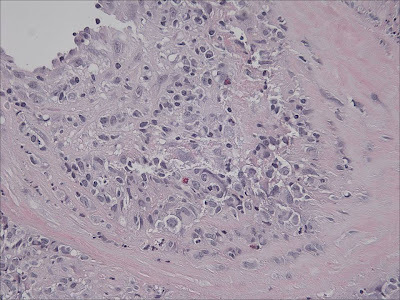 First, this form of vasculitis is not usually associated with a positive ANCA test and this may have been a red herring. 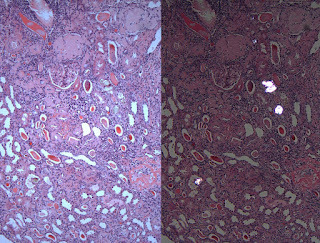 Second, the smaller vessels were normal and if the arcuate artery was not present on the specimen, this patient would likely have been diagnosed with an interestitial nephritis. 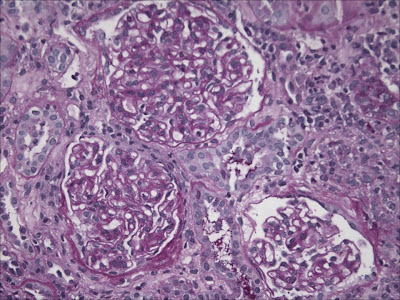 The proteinuria in this case is probably a result of reduced tubular reabsorption given the fact that there is no significant glomerular disease. The low serum albumin was most likely due to GI losses rather than renal. Although we associate interstitial nephritis with drug use and know that it was classically described in the setting of methicillin use, AIN was initially described in the setting of acute sepsis. Councilman nephritis was first described in 1898 in autopsy specimens of patients who died with sepsis. Given the plethora of drugs that most septic patients are exposed to these days prior to any biopsy, this is a difficult diagnosis to make at this point but it should be remembered that not all AIN is drugs. The image below is a plate from that paper which is available for free online. 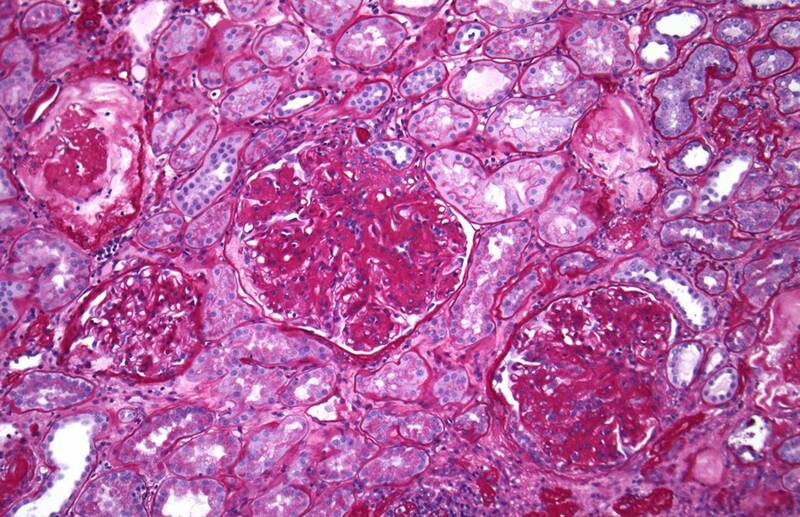 A man in his 30s with a history of type 1 DM and chronic hypokalemia was referred to the renal clinic for investigation of CKD. His creatinine was 1.8g mg/dl. His DM was well controlled without any evidence of retinopathy. Urinalysis did not show any proteinuria or hematuria. 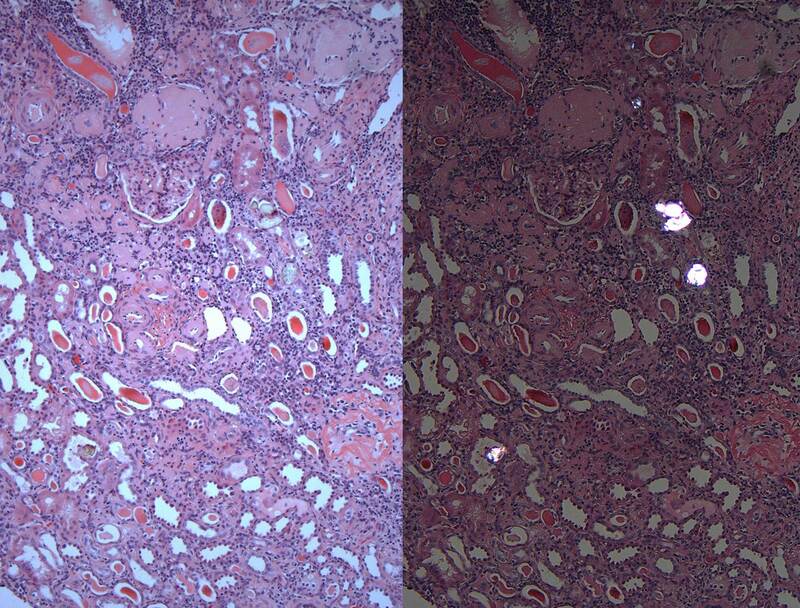 His renal biopsy showed focal tubular atrophy, dystrophic calcification in the scattered tubules, and did not have any signs of diabetic nephropathy. 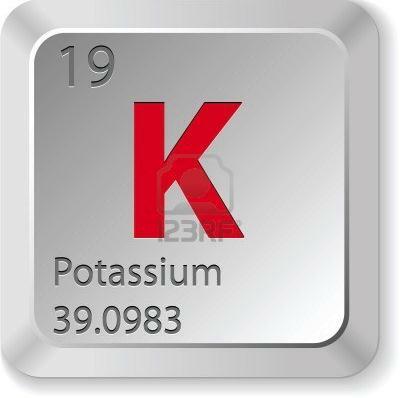 His renal biopsy findings were therefore attributed to chronic hypokalemia. Hypokalemia can cause kidney damage if it persists for longer than one month. Chronic hypokalemia can cause non-specific vacuolar lesions in the epithelial vessels in the proximal tubules. 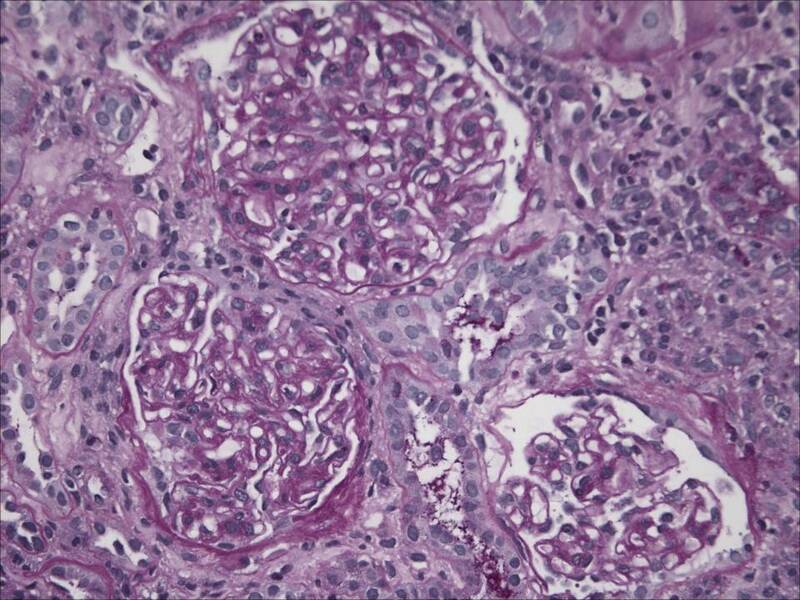 Typical renal biopsy will show interstitial nephritis, fibrosis, tubular atrophy and cyst formation. 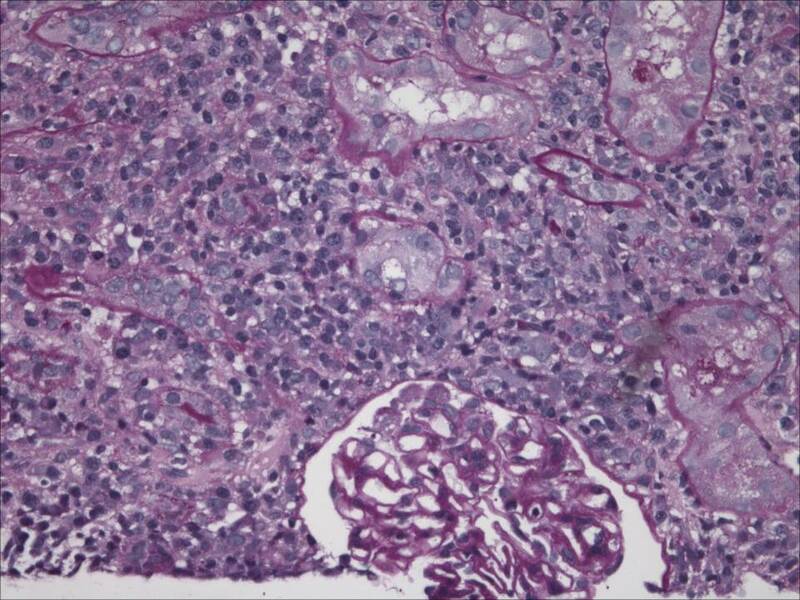 The pathogenesis of hypokalemic nephropathy is not clear. The hypotheses are: 1) complement activation and tubular cell damage by hypokalemia induced renal ammonium production 2) stimulation of cell growth and proliferation by intracellular acidosis 3) increased production of growth factors (VEGF, IGF-1) and cytokines by hypokalemia through an uncertain mechanism. After further work-up, our patient was diagnosed with Giltelman syndrome. 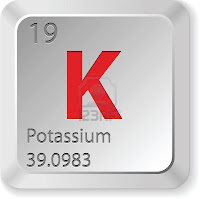 He was started on potassium replacement and his Cr has remained stable since then.